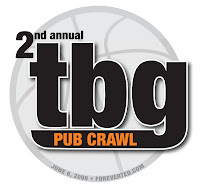 The 2nd Annual TBG Pub Crawl, a one-day benefit for the Ted Everidge Memorial Fund, will take place in Boston on Saturday, June 6, 2009. The eight-bar event will get underway at noon at The Squealing Pig in Roxbury Crossing, located behind Back Bay Manor, where Ted lived for two years in college. The crawl then proceeds Northeastern-area bars - Punter's Pub and Our House East - before heading to Boylston Street to hit Cactus Club, Whiskey's and Rattlesnake. A stop at Beantown Pub then breaks up the walk to the final destination of the crawl, Purple Shamrock. The 2nd Annual TBG Pub Crawl will officially end at 8 p.m. on Union Street, but if last year is any indication, the festivities will continue into the wee hours of the morning. Attendees will receive free appetizers at a various location on the crawl as well as a 4 x 6 group photo from the event, but drinks are not included in the ticket price. All proceeds will benefit the Ted Everidge Memorial Fund. The ticket price has been dropped by $10 this year as an event t-shirt is not included. However, a wide variety of official pub crawl gear can be purchased by clicking here. 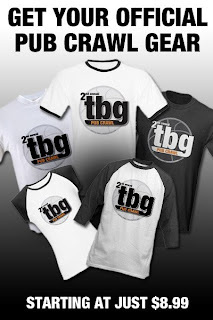 Be sure to purchase your gear to allow ample time for printing and shipping. Also, personalized pub crawl gear is available for certain pieces of apparel for an additional $3.00. If you are interested in having a saying, your name or a nickname put on the back of your shirt, then email K.J. (kj@packnetwork.com) for more information. If you cannot attend but would still like to purchase a ticket to support the cause, then please feel free to do so. Last year's pub crawl raised $600 and we are hoping to break that mark this year. Meme & Papa were kind enough to come down to visit us today and, of course, we had a blast. Like most great times that we have with my parents, we didn't really do much... we never need to. We played with Anna, had some good food, great conversation and of course a few adult beverages. We hung out at home most of the rainy day, but then ventured to the Solomon Pond Mall so Anna could take a ride on the merry-go-round. Angie got to take the ride with Anna while my parents and I got to get a kick out of the look of surprise on Anna's face every time she came around to see us. She even blew Meme & Papa kisses a few times on her way by. Anna is so hilarious. When she got on the horse she was petting him nicely and when she went to get off, she had to give him a kiss. Probably not the most sanitary thing to let your kid do, but what the hell, right? After the carousel ride, we finally broke down and bought Anna her very own punching balloon. The carousel ticket booth has punching balloons already inflated and every time we pass by Anna says "bloon, bloon", but we never bought her one until today. It turned out to be a great decision, if for nothing other than the photo below. Anna thought she was on top of the world as she walked around the mall with her "bloon" with her entourage in tow. Just when I thought the day couldn't get any better, it did. Louisville and Rick Pitino were upset by Michigan State! I couldn't have cared less that I had the Spartans winning in my bracket, but I was extremely fired up that Pitino lost... if you need me to explain why I hate Pitino, please refrain from reading this blog in the future. Anyway, it was a great day from start to finish and the best way that we could think of capping off such a great week. When we awoke this morning, we had little idea of what a great day we would have because Anna woke up at 4:30 a.m. with a low-grade fever. She thankfully fell back to sleep around 5:30 and when she awoke again it was nearly 9 a.m. and we were psyched not only that she let us sleep in, but that she had also kicked her fever. So, with a happy, healthy baby and a beautiful day ahead of us, we decided to go to Drumlin Farms in Lincoln. We had not been there before, but it was "Woolapalooza" so we were pretty much guaranteed a good time. Woolapalooza basically means they hand-shear the sheep and have lots of sheep-related goods on hand for you to see like spinning the wool, knitting, etc... the name is probably actually better than the event itself. Prior to leaving I went online and considered getting a Mass Audubon Society Family Membership, but we opted against buying it right then because we wanted to see how Anna liked Drumlin Farm. When we got there though, they were offering the family membership for HALF PRICE! So, it was really a no brainer because it only cost $29 and we have a year access to the 45 different parks across the state that make up the Mass Audubon Society. Enough about logistics and memberships though. Drumlin Farm was a nice spot. I'm not sure Anna cared about seeing any of the wool exhibits and quite frankly neither did I, but the place had tons of animals. Anna learned how to "hoot, hoot" like an owl and "caw, caw" like a crow. She has also perfected her sheep "baaahhh", so it was perfectly fitting when we encountered this old lady there that was playing Old McDonald on a harp. If it were just Angie and I there, I would've thought this lady was very odd and creepy, but Anna liked her, so it was all good. Anyway, here's a video that shows the day's events. Enjoy! Lastly, I leave you with the following photo... note the sign on the left... classic. Today Anna and I ventured downtown to a new park that I have never taken her to before. It's called Wood Park and it's located right on the Assabet River. It's pretty nice and will be a great spot for us this spring/summer. It's a little further away than the elementary school right down the street, but I actually like it a lot more. After last night's rain the ground was a little muddy, which made Anna want to stop at every puddle and "splash splash" in it, but the playground had dry footing so it was game on for Anna. Her natural go-to is the swings, but Anna is quick to migrate toward the slide and anything else that looks compelling on the playground. She's a big fan of the wobbly foot-bridges that most playgrounds have these days. The one down the street from our house is more like a wobbly plank than a bridge, so she's a little scared by it. But, the one at this new park is a three-foot wide bridge, so once she gets over her initial fear of stepping on it, she motors right across it. The setting of the playground is rather picturesque since it's located right on the river. There is a real foot bridge that goes over the river to a walking path on the other side. When the ground is dry and the foliage starts to come in, I'll be sure to get some good photo ops of Anna. One of my favorite things about Hudson and this area of Massachusetts in general is all the parks, playgrounds, bike paths, etc. They are everywhere. Just in town alone we have at least five public parks and/or playgrounds and a monster bike path that goes along the old Acton railroad tracks... it's now nicely paved and lined and everything. Anyway, as you can tell by the revival of the blog over the past few days, I'm pretty psyched that spring is actually here and that I can get Anna out of the house. I'm also fired up that it's the weekend so we can enjoy the nice weather with Angie too. OK, maybe I threw my back out with that headline... because it was quite a stretch. But just take a look and you'll get a glimpse into the Wonderful World of Anna. She just makes EVERYONE smile... especially her "Daddy" and especially when she's watching someone play Wii. Enjoy! Tiffany, Pete, Andrew and Natalie kicked off their vacation today by meeting Anna and I at this place in Lawrence called Imajine That. It's pretty much a kid's dream. For $8.95 a child, you can spend all day on the second floor of this old mill turned kid's playland. They have everything from an elaborate jungle gym to a kid's grocery store and everything in between. Needless to say it was a blast. I feel like it's been FOREVER since I've seen Andrew and Natalie, so it was such a treat to get to spend time with the kiddos... and Tiff and Pete too, of course. I must say that Andrew is absolutely the nicest, most considerate little kid that I have ever seen. The entire day he was looking out for Anna by helping her up and down parts of the jungle gym, trying to encourage her to go down the big slide by herself and being gentle with the girls in the boucy house. Of all the amazing things about Andrew, I think that his caring and considerate nature (for Anna, in particular) is my favorite thing about him... followed closely by his love affair with Papa... that's just awesome. When we first got there, "Nat Nat" was acting shy with me and almost seemed to be frightened by the sight of me (insert joke here). But after about 15 minutes, she was her normal self smiling right away and flirting with me. She's so good natured it's scarry. After spending a few hours in Imajine That, we ventured downstairs to Sal's for lunch. We had a great time, highlighted by Andrew eating his multi-color, fish-shaped, cheese raviolis with bright blue cheese inside. We parted our ways after lunch. We headed home and the George's continued out to East Hampton to visit the prego Jenny and Rob. So many of our friends now are pregnant... it's unbelievable. Anna's great day continued when we got home as we played with her Easter gifts from Andrew (sidewalk chalk and a bubble gun) before heading out for a long bike ride. We stopped off at the playground down the street first so she could hit the swings and go down the slide and then we were off for downtown. We rode all the way down to Dairy Joy, but no, we didn't stop to get an ice cream. Then, we headed home. KJ: Do you want to sleep? It was a cute exchange the first time, but I got a real kick out of it by about the third time she pulled the routine. I was expecting her to just fall asleep in the bike seat, but she didn't. I can't express how much Anna loves the outdoors. We were gone on our bike ride for about two hours and sure enough when we got back home and went into the house, she ran over to the front door and started crying and saying "Out, out". I've never seen a kid that likes the outdoors so much. It was a gorgeous day, so I kind of felt her pain about heading inside... but I had a blog post to write... give a Dad a break. When I left my job at America East in the summer of 2007, never in a million years did I think it would be possible for me to have a busier work schedule in the month of March, but boy was I wrong. Pack Network has really taken off lately and our services have been in high demand. For the seven-day stretch from March 7-13, we produced an unthinkable 22 basketball games... 16 of which I worked. We did the Northeast-10 Conference men's and women's title games, the Northeast Conference women's quarters and semis (six games), the National Prep Championship (seven games), the America East first round and quarters (five games) and two games at BU. Luckily my travels only had me going as far away as Hartford, but it was quite a whirlwind week nonetheless. So needless to say, I was glad to be home with the girls all day yesterday. Last fall Angie bought this MacPac, a baby backpack. We hadn't really been able to use it, so yesterday was its maiden voyage. The three of us took advantage of the awesome weather and went for a long walk. Our plan was to hit up a local playground, have lunch at the Horseshoe Pub and then return back home. Anna has clearly developed quite a bit of courage since the last time we went to a playground as she was going down the slides all by herself. The MacPac is definitely cool and Anna really enjoys being in it. Our trip had us walking probably 3-4 miles, so the last half mile or so I was more than ready to take the pack off. But, Anna fell asleep, so it was totally worth it. I know I've said it a million times, but I can't wait for the nice weather to be here to stay. Anna is at such a great age to go outside and play and she LOVES it. In fact, when we got home yesterday and went inside our house, she stood looking out the small window next to our front door and was crying because she wanted to go back outside. This week I think I am going to buy a bicycle and pick up this baby bike seat that I bought on craigslist. I think Anna will really get a kick out of that. Also, Katie is coming down today as we have a big day of boozing it up in the city for St. Patrick's Day planned. If anyone of you blog readers out there are going to be in the city tomorrow, let me know and we'll try to meet up. Follow my twitter tomorrow...I'll try to update it plenty throughout the day. Well, I have finally ventured into the world that is Twitter. My recent delinquency with the blog got me thinking that sometimes less is more. For those of you who don't know, Twitter is a social networking site where people can post updates on what they're doing and thinking... no longer than 140 characters. So, it's not nearly as involved, complex or time consuming as a blog, but it a similar notion... let's you tell the world what the hell you've been doing and what's going through that crazy mind of yours. The coolest thing about twitter is that you send updates via your cell phone. I actually have it set up so twitter emails me daily to remind me to post too, so I think that I'll do a good job of updating it daily. Anyway, you can join twitter for free if you want and then add me as a friend and follow my twitter. Also, my twitter automatically updates to my blog in the column to the right. Should be interesting, so stay tuned. Well, yesterday I turned the big Two Nine. That's right, 29. The last year of my twenties. Age really doesn't mean anything to me, but it was good to have a few people over on Saturday night to celebrate the occasion. Other than hanging out with my friends, the highlight of the night was the birthday cake that Katie made for me. It was a replica of Fenway Park and it was awesome. The Citgo Sign, Green Monster and Coke bottle...it was so cool. I know it took a long time to make, Kater, so thanks so much! Things have obviously been busy as I haven't had a chance to update the blog too much lately, but let me get caught up on last week. My parents had school vacation, so they came down on Wednesday to get their fix of Anna. We had a good day just hanging out at home on Wednesday with them and then at the crack of dawn Thursday they were off to Foxwoods. I had worked ahead so I was able to join them at the casino on Thursday afternoon. We were having such a great time and not losing too much money, so I spent the night and got up first thing on Friday morning to head home. The weather was gorgeous on Friday and I was able to get Anna outside to go for a walk and to play in the yard. I can't tell you how much I can't wait for good weather to come so we can get outside and do stuff everyday. This snow storm today stinks because it delays that for another week... at least. Anna was so content hanging out in the backyard and watching the "truck" clear out the yard of the house behind ours. She couldn't believe it when the guy in the "truck" waved to her... she thought it was so great... but I think he loved her reaction even more.